For the monument, see Drinking Fountain, Roehampton. "Bubbler" redirects here. For other uses, see Bubbler (disambiguation). "Water fountain" redirects here. It is not to be confused with Fountain. A bubbler also called a drinking fountain or water fountain, is a fountain designed to provide drinking water. It consists of a basin with either continuously running water or a tap. The drinker bends down to the stream of water and swallows water directly from the stream. Modern indoor drinking fountains may incorporate filters to remove impurities from the water and chillers to lower its temperature. Drinking fountains are usually found in public places, like schools, rest areas, libraries, and grocery stores. Many jurisdictions require drinking fountains to be wheelchair accessible (by sticking out horizontally from the wall), and to include an additional unit of a lower height for children and short adults. The design that this replaced often had one spout atop a refrigeration unit. Use of the words water fountain and drinking fountain vary across regional dialects of English. Before potable water was provided in private homes, water for drinking was made available to citizens of cities through access to public fountains. Many of these early public drinking fountains can still be seen (and used) in cities such as Rome, with its many fontanelle and nasoni (big noses). In mid-19th century London, water provision from private water companies was generally inadequate for the rapidly growing population and was often contaminated. Legislation in the mid nineteenth century formed the Metropolitan Commission of Sewers, made water filtration compulsory, and moved water intakes on the Thames above the sewage outlets. In this context, the public drinking fountain movement began. It built the first public baths and public drinking fountains. In London, the Metropolitan Free Drinking Fountain Association was established in 1859. The first fountain was built on Holborn Hill on the railings of the church of St Sepulchre-without-Newgate on Snow Hill, paid for by Samuel Gurney, and opened on 21 April 1859. The fountain became immediately popular, used by 7,000 people a day. In the next six years 85 fountains were built, with much of the funding coming directly from the association. The movement soon became associated with the temperance movement as they provided a substitute for alcohol and were purposely positioned outside public houses. Muddied and bad tasting drinking water encouraged many Americans to drink alcohol for health purposes, so temperance groups constructed public drinking fountains throughout the United States following the Civil War. The National Woman's Christian Temperance Union (NWCTU)'s organizing convention of 1874 encouraged its attendees to erect the fountains in their hometowns. The NWCTU advocated the fountains as a means to discourage people from entering saloons for refreshment. The NWCTU sponsored temperance fountains in towns and cities across the United States. After many of the aqueducts were destroyed after the siege of Paris in the 1870s, the Parisian poor had no access to fresh water. Richard Wallace, an Englishman, used the money from an inheritance to fund the construction of 50 drinking fountains (ever after known as ‘Wallace fountains’). Designed by Charles-Auguste Lebourg with four caryatids atop a green cylindrical base, these fountains have become iconic symbols of Paris. The provision of drinking fountains in the United Kingdom was also linked to the temperance movement in the United Kingdom, with the Metropolitan Drinking Fountain and Cattle Trough Association in London drawing support from temperance advocates. Many of its fountains were sited opposite public houses. The evangelical movement was encouraged to build fountains in churchyards to encourage the poor to see churches as supporting them. Many fountains have inscriptions such as "Jesus said whosoever drinketh of this water shall thirst again but whosoever drinketh of the water I shall give him shall never thirst". By 1877, the association was widely accepted and Queen Victoria donated money for a fountain in Esher. Many fountains, within London and outside, were called temperance fountains or would have a representation of the Greek mythical figure Temperance. A movement concerned with animal welfare resulted in the founding of the American Society for the Prevention of Cruelty to Animals in 1866. One of its concerns was the difficulty of finding fresh water for work horses in urban areas. Combination drinking fountains that provided a bubbler for people and a water trough for horses, and sometimes a lower basin for dogs, became popular. In particular, over 120 National Humane Alliance fountains were donated to communities across the United States between 1903 and 1913. The fountains were the gift of philanthropist Hermon Lee Ensign. One myth claims that drinking fountains were first built in the United States in 1888 by the then-small Kohler Water Works (now Kohler Company) in Kohler, Wisconsin. However, no company by that name existed at the time. The original 'Bubbler' shot water one inch straight into the air, creating a bubbling texture, and the excess water ran back down over the sides of the nozzle. Several years later the Bubbler adopted the more sanitary arc projection, which also allowed the user to drink more easily from it. At the start of the 20th century, it was discovered that the original vertical design was related to the spread of many contagious diseases. 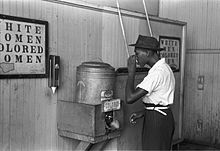 Drinking fountains in the United States were often subject to racial segregation, until all legally enforced public segregation (segregation de jure) was abolished by the Civil Rights Act of 1964. A drinking fountain with a guard to prevent contact between spigot and user's mouth. In recent studies, it has been found that some drinking fountains have been contaminated with pathogens such as bacteria. In one study, a virus commonly known to cause diarrhea in young children known as the rotavirus has been found on drinking fountains in child day care facilities. Due to cases in the past where children have fallen ill due to coliform bacteria poisoning, many governments have placed strict regulations on drinking fountain designs. The vertical spout design[clarification needed] is now illegal in most US jurisdictions. Some governments even require water spouts to be as long as four inches to meet health standards. It is also recommended for young children to allow drinking fountains to run before drinking, as the water may also be contaminated with lead. This is especially common in older buildings with obsolete plumbing. In the 1970s, this fear of contamination in tap water was hyped by producers of bottled water, thereby changing attitudes to publicly provided water in drinking fountains, which began to disappear from city streets. The term bubbler is used in some regional dialects of the United States and in Australia. A survey of US dialects undertaken between 2002 and 2004 found the word bubbler is commonly used in southern and eastern Wisconsin and in Massachusetts and Rhode Island. The phrase drinking fountain was common in the rest of the inland north and in the west, while water fountain dominated other parts of the country. The term bubbler is sometimes used in the Portland, Oregon, region where in the early 1900s former Wisconsin resident Simon Benson installed 20 fountains, which are now known in the Portland area as "Benson Bubblers". Currently, there are 52 of these iconic four-bowl drinking fountains still providing free-flowing water in downtown Portland. An outdoor fountain at the Barbara Chapel above the Bielerhöhe mountain pass, Vorarlberg, Austria. Frost-resistant drinking fountains are used outdoors in cold climates and keep the control mechanisms below the frostline resulting in a delay for when water comes out. The typical drinking fountain in Rome, called "Nasone" (Big Nose), there are approximately 2500 of them. A Wallace fountain in Paris, there are 67 of them. Drinking fountains in Berlin (in German Trinkbrunnen). Draghi Verdi (Green Dragons) in Milan, there are 480 of them. ^ a b Philip Davies. Troughs and Drinking Fountains. ISBN 0-7011-3369-4. ^ "Victorian fountains". The website of Bob Speel. Retrieved 26 April 2014. ^ "WCTU Drinking Fountains - Then and Now". Woman's Christian Temperance Union. Woman's Christian Temperance Union. 1996–2009. Archived from the original on 14 October 2011. Retrieved 9 June 2012. ^ WCTU Drinking Fountains – Then and Now Archived 2011-10-14 at the Wayback Machine, from Woman's Christian Temperance Union. ^ Massounie, Dominique, Pauline Prevost-Marcilhacy and Daniel Rabreau (1995). Paris et ses fontaines de la Renaissance a nos jours. Paris: Delegation a l’action artistique de la ville de Paris. p. 205. ISBN 2-905-118-80-6. ^ Dippel, Beth (31 October 2014). "Debunking the the(sic) bubbler myth". Sheboygan Press. Retrieved 18 January 2019. ^ a b "Is it Safe to Drink from Public Drinking Water Fountains?". aquasana. Archived from the original on 9 January 2014. Retrieved 27 June 2013. ^ Bernard, Bruce (15 March 2013). "Where Have All the (Public Water) Fountains Gone?". Water quality and health. Retrieved 26 April 2014. ^ "Fact Sheet: Drinking Water in Schools". The Green Squad. Retrieved 27 June 2013. ^ Pierre-Louis, Kendra (July 8, 2015). "We don't trust water fountains anymore, and that's bad for our health". The Washington Post. Retrieved October 2, 2018. ^ Christensen, Sean (2 December 1994). "LINGUIST List Sum: Use of bubbler as a synonym for drinking fountain". Retrieved 13 June 2013. ^ "Bubbler map". 2004. Retrieved 13 June 2013. ^ Zeb Larson. "Benson Bubblers". The Oregon Encyclopedia. Retrieved 11 August 2013. ^ "Benson Bubblers". Portland Water Bureau. Retrieved October 2, 2018. ^ Ivanov, Jossie. "Frost-Proof Fountains". Drinking Fountains. Retrieved 3 June 2016. Look up drinking fountain in Wiktionary, the free dictionary. Wikimedia Commons has media related to drinking fountains.